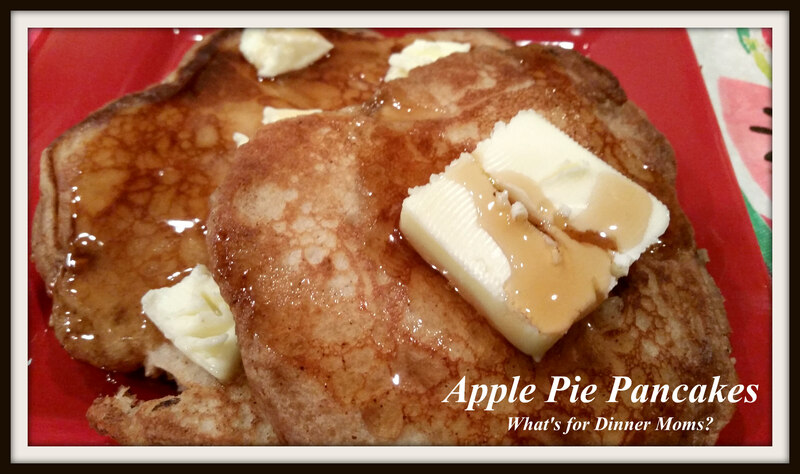 Apple Pie Pancakes – What's for Dinner Moms? Sometimes breakfast for dinner is a great option when you are looking to have dinner on the table quickly. Whether it is pancakes, waffles or eggs dinner can be fun and on the table quickly. Apples are plentiful and inexpensive in our area right now and we have gotten several bunches in our CSA share. I needed something for dinner the other night and wanted to use some of these apples that I have leftover before they go bad. Let’s combine breakfast and the apples! These had all the flavors of an apple pie! My children loved the apples with cinnamon and sugar so much they put extra over their pancakes rather than maple syrup or butter then they asked for more apples in a bowl for a snack later. You can make these pancakes as sweet as you like. If you want them a bit sweeter just add a bit more sugar. Tip: Remember to taste everything and season them so you and your family will like them. If you don’t like cloves? Leave it out. Try different spice combinations if necessary. At least 15 minutes before making the pancakes mix apples, sugar and cinnamon together in a bowl. Stir well and set aside. In a second bowl mix flour, baking powder, and sugar in a large bowl. Stir until well combined. In another bowl or 4 cup measuring cup mix eggs, vegetable oil and milk until well combined. Stir the wet ingredients into the dry ingredients until just mixed together. There will be lumps in the batter. Just before cooking pancakes add the 2 cups of the cinnamon coated apples with the liquid in the bottom of the apple bowl with the cinnamon, nutmeg, cloves, and salt to the batter stir to combine well. To cook pancakes – cook 1/3 cup of batter on a griddle over medium low heat with melted butter to keep the pancakes from sticking. Turn halfway through cooking until browned on each side. Place in a warmed oven to keep warm until all pancakes are cooked. Serve topped with butter and syrup or extra cinnamon and sugar apples, as desired. Marci, have you tired using melted butter rather than vegetable oil in your pancake batter? MMM! I have done it both ways. Also, I have used apple sauce. Breakfast for dinner, why not?? YUM! Thanks, Lynn! It means so much each time I see your name on here! This will be awesome for brunch!